WASHINGTON -- Nationals outfielder Ryan Church and team chaplain Jon Moeller, who led chapel services on Sundays at RFK Stadium, found themselves enmeshed in controversy when a statement by Church suggesting that Jews are doomed appeared in Sunday's edition of The Washington Post. The team suspended Moeller's credentials pending a further and more in-depth investigation of the facts surrounding the story. Interim general manager Jim Bowden gave Moeller the news, according to team president Tony Tavares. In the story, which appeared on the front page of the paper and focused on the team's Baseball Chapel, Church was quoted as having asked Moeller about his ex-girlfriend, who is Jewish. "I said, like, Jewish people, they don't believe in Jesus. Does that mean they're doomed?" Church said. "Jon nodded, like, that's what it meant. My ex-girlfriend! I was like, man, if they only knew. Other religions don't know any better. It's up to us to spread the word." Church apologized in a statement released Tuesday by the Nationals. "Those who know me on a personal level understand that I am not the type of person who would call into question the religious beliefs of others," said Church. "I sincerely regret if the quote attributed to me in Sunday's Washington Post article offended anyone." Tavares said there was no intention of suspending Church. "I asked him if he really believed that if you grew up in either a Jewish or Muslim family that you are [doomed] just because you aren't Christian, and his answer was no," said Tavares. Bill Ladson is a reporter for MLB.com. This story was not subject to the approval of Major League Baseball or its clubs. Note from David W. Fisher: Until this unfortunate incident is resolved I'm going to reserve comment. We are praying for Jon during this very difficult time. Jon Moeller is a godly man with a servant's heart. Please join me in lifting him up before the Lord these days. 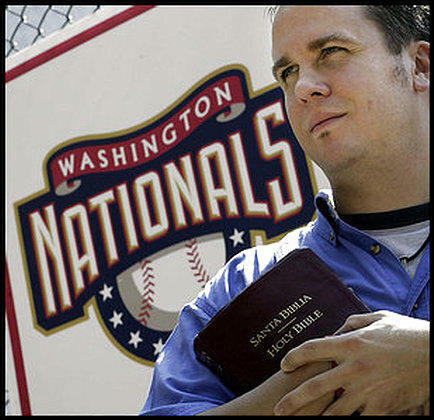 My prayer is that Jon will be allowed to return to his Baseball Chapel responsibilities and that his credentials from the Washington Nationals will be restored.